We will explore the world above and below its surface, at the seaside by our school where there are more then 100 ship wrecks, and in exotic waters with a rich diversity of life. We also climb the walls of Southern Norway and surf the waves of the South and West of Norway as well as in Denmark. Diving - magnificent walls, beautiful corals and big wrecks waiting to be explored by you! The area around Kristiansand Feriesenter Dvergsnestangen, is known among divers for its strategic location with a host of great diving spots. "Wrecks in Kristiansand"
This course is suitable for both beginners and for everyone who has some basic experience, but have not dived that much or simply want new challenges. 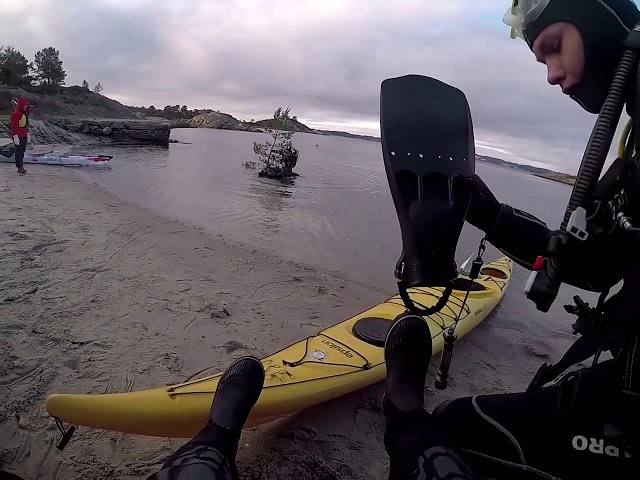 Join stunning diving trips in the Kristiansand seaside, from shore and by boat. Learn to film and take photos underwater and help editing. Dive with sharks in the aquarium in Greena in Denmark. We are a lot outside, on boat trips, sailing, kayaking and other trips in the area around the school. We catch crabs, fish and learn a lot about the nature.